Yesterday, March 21, 1994, Bob and I went over to May and Lincoln Diess’ home to interview them for an article in The Lorane Historian. It was a beautiful sunny afternoon, and we heard a lot of stories of years gone by. We have known May and Lincoln since we moved to Lorane, and we had interviewed them when we wrote Sawdust and Cider, but every time you talk with them, you find out something you didn’t know before. As I sit at my computer going over my notes from yesterday’s interview, it is snowing like crazy outside, and the ground is white. All my bright yellow daffodils are covered with snow. Oh well, maybe next week we will have spring! Lincoln Diess was born in the community called Hadleyville. The Hadleyville School was off Territorial Road on Briggs Hill Road (between Lorane and Crow). Lincoln was born on the property on Territorial Road located on the north side of Territorial Road, south of Briggs Hill Road. Lincoln’s sister, Opal McDaniel , still lives in the house that is now on it. Lincoln’s father, Benjamin Franklin Diess, was also born in Hadleyville in about 1879 in a house that was on the ridge behind and between the Ellis “Hap” Rackleff home near Gillespie Corners and the Mike Atkinson home located across Territorial Road from Powell Road. Lincoln’s grandfather came to the United States from Germany, and Lincoln is not sure when the family originally settled in the Hadleyville area. Lincoln remembers as a young boy that there were a lot of jack rabbits but not many deer in the area. Lincoln graduated from Crow High School in 1931. He went to the University of Oregon and graduated in 1937 with a degree in accounting. He was also the 1934 Light-Heavyweight Boxing Champion while at the University of Oregon. At one point during the “hungry 30’s”, tuition dropped to $21.50 a term, with an optional $5.00 student body fee if you wanted to attend any athletic events. While in college, Lincoln and two other Crow boys “batched” together. His first job was working for Weyerhaeuser in Washington where he worked for one year. He came back to the Eugene-Lorane area and worked as a farmer and logger. He never used his accounting degree after the first year. May moved to Lorane with her parents, Rose (Streiff) and Charles Schaffer when May was nine years old. After May’s grandfather, Louis Schaffer, died in 1920, her father bought the family’s original 600-acre farm near Lorane in 1921 (see Sawdust & Cider). The farm had been in the family since 1905. May attended the Green Door School and graduated from Lorane High School in 1929. She went to the University of Oregon for two years and then went to work cleaning houses for some wealthy families in Eugene. May and her sister, Pearl, drove a 1929 Model A back and forth to Eugene for a year while they were going to college. The two girls raised pigs to earn enough money for their college tuition which was, at that time, $25.75 per term with an added $10.00 lab fee. With all of the traveling and tending of the animals, it did not leave much time for studying. After one year of traveling back and forth they rented a room and stayed in town. 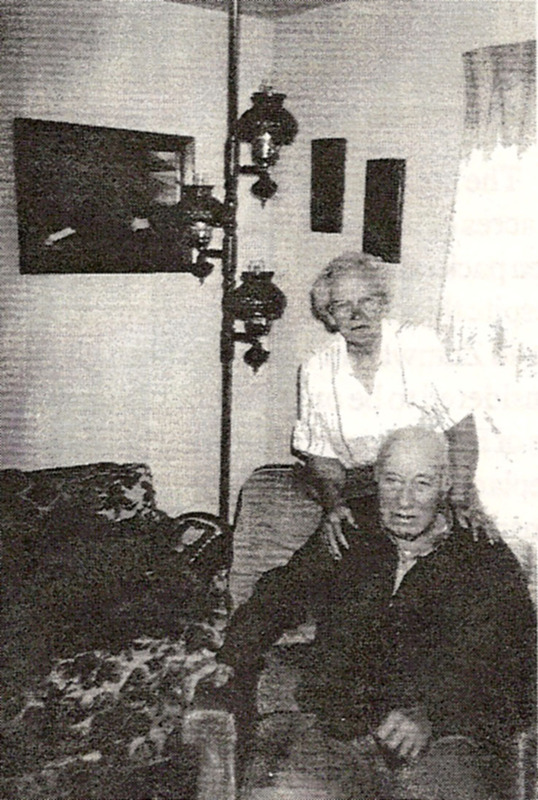 May and Lincoln started going together in 1933 when May was working in Eugene. May told us that she would not marry Lincoln until he graduated from college because she figured if they got married before he received his degree, he would not continue with his education. They were married on June 8, 1937. They moved back to Lorane in 1944, renting the original Schaffer place located on the west side of Territorial Road about a mile south of Marlow-Jackson Road from her parents. They eventually purchased the 500+ acre farm. Lincoln and May again moved from the area for a time and returned in the early 1950’s, buying another 500+ acres on which they built their present home in 1953. They raised two boys, Frank and Floyd who attended Lorane Elementary School and graduated from Lorane High School. Floyd lives in the Salem area and is retired from his job with the city of Salem. He and his wife, Clare, have two children and no grandchildren, as yet. Frank lives in the Eugene area and works for Eugene Sand & Gravel and is thinking about retiring soon. He and his wife, Judy, have three children and no grandchildren. Lincoln is an avid hunter and fisherman. May is one of the best cooks in Lorane and is seen almost every day during the spring and summer, working in her garden. They have always been involved in community affairs. May has been a volunteer for the Lane County Blood Mobile program when it used to come to Crow on a regular basis. They have been active members of the Lorane Grange #54 for 43 years. Lincoln served on the Lorane School Board for several years and was a substitute school bus driver for the district. I asked Lincoln and May what has been the biggest changes in the Lorane area and they both agreed that it is the way people make a living. When they were growing up, everyone made a living by farming. The more land you had, the more farming you could do. May remembers what a big event it was for the threshing machine to come to their place to do their fields. Everyone knew when it was time for their fields to be done. Elmer Crowe did the work for the Lorane area people. His crew would go from one farm to another until all of the fields were done. Lincoln remembers it as being a lot of hard work, but the food was great. He never ate so much fried chicken in his life as he did during the time he worked on the threshing crew. There were always plenty of pies and cakes, too. He remembers that May was considered one of the best cooks by the threshing crews. Any time that they would hitch a wagon to go the considerable distance to Eugene for supplies, they would take something to the market to sell to make the trip worth their while. That could mean vegetables or livestock of some kind. I have been very encouraged by the recent number of submissions that I have been getting, and I want those people to know that everything that I receive will be included in future issues. Thank you for your participation.